German city on the right bank of the Elbe, between Sleswick-Holstein and Hanover. The first Jewish settlers were Portuguese Maranos, who had fled from their own country under Philip II. and Philip III., at first concealing their religion in their new place of residence. In 1603 the aldermen ("Bürgerschaft") made complaints to the senate about the growing influx of Portuguese Jews. The senate asked the theological faculties of Jena and Frankfort-on-the-Oder for their opinions in the matter, and in 1612, after many negotiations, it was agreed that, in consideration of a payment made for their protection, the Jews should be tolerated in the town as strangers, though they were not to be allowed to practise their religion publicly. According to a "rolla" or list of that time, they numbered 125 adults, besides servants and children. From 1611 they possessed a cemetery in Altona, which was used until 1871 (see illustration s.v. Altona). In 1617 they obtained the right to choose four sworn brokers from among their own people; and later on this number was increased to fifteen. These Portuguese Jews, mainly engaged in the wholesale trade, greatly helped the commerce of the town. They were the first to open up trade with Spain and Portugal; they imported from the colonies sugar, tobacco, spices, cottons, etc., and they took a prominent part in the foundation of the Bank of Hamburg (1619). Of their eminent men the best known is the physician Rodrigo de Castro, who lived in Hamburg from 1594 till his death. In recognition of his valuable professional services the senate granted him the privilege of owning real estate in the town. Other notables were: Boccario Rosales, who distinguished himself as an astronomer, the emperor conferring upon him the title of "comes palatinus"; Joseph Frances, the poet; Moses Gideon Abudiente, the grammarian; and Benjamin Mussafia, the physician, philosopher, and linguist. As early as the year 1627 the Portuguese Jews possessed a small place of worship, styled "Talmud Torah," in the house of Elijah Aboab Cardoso. Emperor Ferdinand II. addressed bitter complaints to the senate about this "synagogue," the Catholics not being allowed to build a church in Hamburg at that time. But, in spite of this protest and the violent attacks of the Protestant clergy, the senate continued to protect the Jews. Their first ḥakam was Isaac Athias of Venice, whose successor was Abraham Ḥayyim de Fonseca (d. Iyyar, 5411 = 1651), also ḥakam of another synagogue, Keter Torah. In 1652 the Portuguese formally constituted themselves a congregation with a large synagogue, Bet Israel, and chose as chief rabbi ("ḥakam do naçao") the learned David Cohen de Lara (d. 1674). With him Ḥakam Moses Israel, and, a little later, Judah Carmi were rabbis of the congregation (both died in 1673). In 1656 Isaac Jesurun was called from Venice to Hamburg, there to take the place of chief rabbi ("ḥakam geral") . . . "for the promotion of religion and the general welfare," . . . as the oldest minute-book of the congregation says. Apparently offended by this call, Cohen de Lara took leave for a few months and afterward went to live at Amsterdam. After the death of Jesurun (1665), De Lara went back to Hamburg, where he died. Among the early elders of the congregation was Benedict de Castro, a son of Rodrigo, and, like his father, a well-known physician. In 1663 the Sephardic congregation, at that time the only acknowledged Jewish community at Hamburg, consisted of about 120 families. Among these were several distinguished by wealth and political influence: Daniel Abensur (d. 1711) was minister resident of the King of Poland in Hamburg; Jacob Curiel (d. 1664) and Nuñez da Costa acted in a similar capacity to the King of Portugal; Diego (Abraham) Texeira (d. 1666) and his son Manuel (Isaac) Texeira, who administered the fortune of Queen Christina of Sweden. Manuel was the celebrated minister resident of Queen Christina in Hamburg. Jacob Sasportastaught from 1666 to 1672 at a bet ha-midrash founded by Manuel Texeira, and was often called upon, as ḥakam, to decide religious questions. 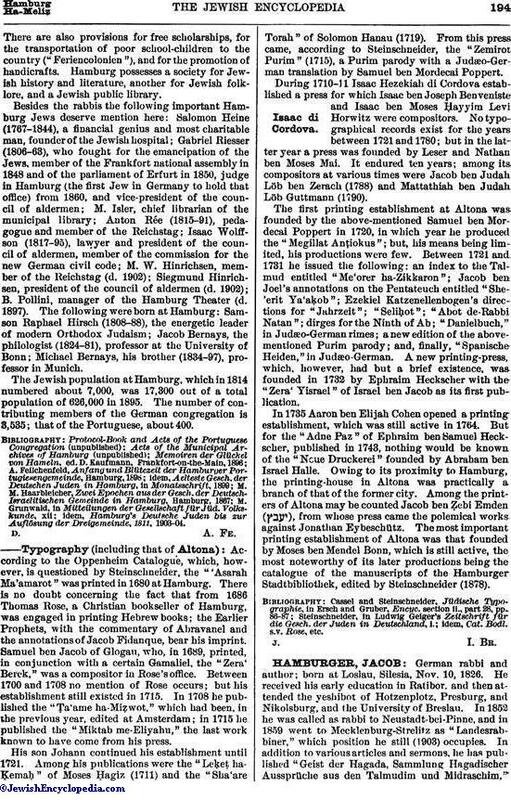 The Hamburg Sephardic Jews took great interest in the movements of the false Messiah Shabbethai Ẓebi. They arranged celebrations in his honor in their principal synagogue, the young men wearing trimmings and sashes of green silk, "the livery of Shabbethai Ẓebi." Sasportas tried in vain to damp this enthusiasm, which was to be bitterly disappointed a few years later. Other rabbis of the congregation were Jacob ben Abraham Fidanque, Moses Ḥayyim Jesurun (d. 1691), Samuel Abaz (d. 1692), and Abraham ha-Kohen Pimentel (d. 1697). In 1697 the freedom of religious practise which the congregation had obtained was disturbed by hostile edicts of the aldermen, and the Jews were extortionately taxed. On this account many of the rich and important Portuguese Jews left Hamburg, some of them laying the foundation of the Portuguese congregation of Altona. Internal quarrels, and especially the withdrawal of Jacob Abensur (minister resident of the King of Poland) and his followers, were other causes of the decline of the Sephardic congregation in Hamburg. In the meantime the German Jews had been increasing in importance and numbers, though they were not yet publicly protected by the Hamburg authorities. In 1583 twelve German-Jewish families had asked in vain for admission to the town; in the second quarter of the seventeenth century several Jewish merchants went to Hamburg, mostly from Altona, where, through the tolerance of the counts of Schaumburg, Jews had for some time been admitted. In the Danish safe-conduct ("Schutzbrief") of 1641 granted to the Jews of Altona, protected Jews ("Schutzjuden") living in Hamburg are mentioned. In 1648 the council of aldermen issued an order expelling the German Jews("Hochdeutsche Juden") from the town. They moved to Altona, and were required to pay a monthly tax for the privilege of transacting business in Hamburg. In 1657 the Swedes invading Altona drove them out, and they, together with the other Jews of Altona, fled to Hamburg. At this time fifteen Jewish families remained in Hamburg tacitly tolerated by the senate, and out of these families, which lived under Danish protection, the Altona congregation in Hamburg was formed. Other German Jews were admitted after 1654, under the protection of the privileged Portuguese congregation—at first only as servants of the Portuguese—and these founded the Hamburg congregation, which continued to be under the control of the Portuguese till 1671. David Tebel is mentioned as their first rabbi. In 1671 both the Hamburg and the Altona congregation in Hamburg placed themselves under the chief rabbi of Altona. Soon afterward the Jewish congregation of Wandsbeck with its branch congregation in Hamburg joined this union, making one congregation known as "The Three Communities" (see Altona), the first chief rabbi being Solomon Mirels of Neumark (d. 1706). The German Jews of Hamburg were principally engaged in retail businesses, and they soon became an important factor of the new town ("Neustadt"), founded in the first half of the seventeenth century. But, having no right to live in Hamburg, they were persecuted most violently by the clergy, and their services were often disturbed. In 1697 the aldermen forced the senate to exact a large sum of money from the German Jews and to impose heavy restrictions upon them. In spite of the state of suppression in which the German Jews lived at this time there was much spiritual life among them. As a writer Glückel Hameln, who lived in Hamburg in 1700, deserves mention here: she left a highly interesting autobiography in Judæo-German. In 1710 an imperial commission, which visited the town for the purpose of making peace between the senate and the aldermen, fixed the position of the Hamburg Jews by certain regulations ("Reglement der Judenschaft in Hamburg Sowohl Portugiesischer als Hochdeutscher Nation"), promulgated in the name of Emperor Joseph I. This edict became the fundamental law for the treatment of the Jews in Hamburg during the ensuing century. The German Jews were legally settled in Hamburg, and they enjoyed almost the same rights as the Portuguese. The Portuguese, proud of their noble lineage, were very dissatisfied at being put on a level with the German Jews, and segregated themselves more and more from them. As a result of this exclusiveness, and for want of fresh accessions, their community declined in the course of the eighteenth century and lost its leading position among the Hamburg Jews. Still, it had some well-known ḥakams; e.g., Jacob de Abraham Basan, who wrote an order of prayers (still extant) for a fast-day held after the earthquake of Lisbon (1755); and Benjamin Benveniste (d. 1757). But learning and interest in Jewish affairs waned in the Portuguese community, and its institutions were neglected. The sheḥiṭah, formerly under its sole supervision, went over to the German community, which in exchange had to pay to the Portuguese one-fourth (since 1856 one-eighth) of the total proceeds of the meat-tax. The principal synagogue of the Portuguese congregation was burned in the great fire of 1842; and since then they have possessed a small place of worship only, the service being maintained with all the old Spanish rites and melodies. Since the beginning of the nineteenth century they have had no ḥakam. Their last preacher and spiritual chief was Judah Cassuto, who officiated as ḥazzan from 1827 to 1893. During the eighteenth century the three German communities of Hamburg flourished in their union with Altona and Wandsbeck. They had many eminent rabbis, of whom the most important were Ezekiel Katzenellenbogen (1712-49), Jonathan Eybeschütz (1749-64), and Raphael ha-Kohen (1776-99). The last chief rabbi of the Three Communities was Ẓebi Hirsch Zamosz (1803-07). 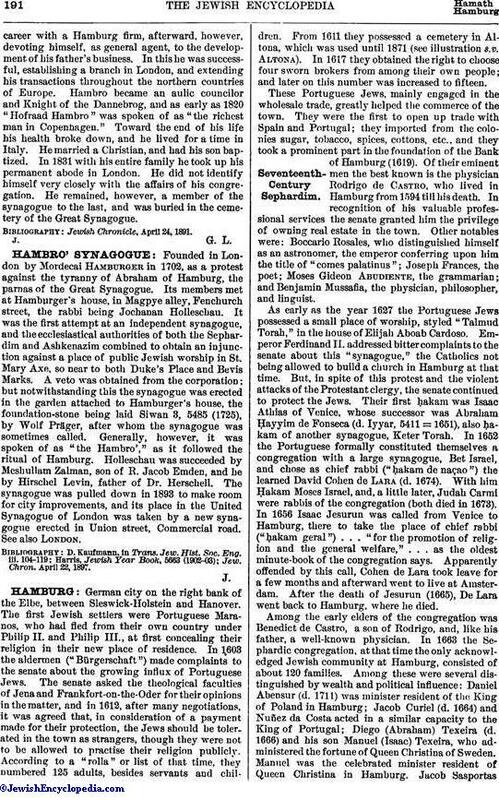 In 1811, Hamburg being incorporated in the French empire, the Jews of that town were forced by an order of Napoleon to withdraw from the congregation of the Three Communities, and to form of the three Hamburg congregations a new community.The constitution of this new community was established in the following year. At the same time the old restrictions were abolished, and full equality before the law was given to the Hamburg Jews, as to all the Jews in the French empire. During Davoust's terrorism in the winter of 1813-14 the Jewish community had much to suffer through the expulsion of its poorer members. In 1814, the town being freed from the French occupation, and the senate reestablished, civil rights were again denied to the Jews, although the latter had shown great attachment to their native town. This injustice was sanctioned by the Congress of Vienna ("Deutsche Bundesacte"), 1815. Of all the French institutions there remained only the civil registers of births, marriages, and deaths (these were kept separately for the Jews until 1865). In 1818 the Tempel was founded—a synagogue with an entirely modified service, and with an organ, a choir, and a new and much abridged prayer-book. The Orthodox party obtained a strong leader in Isaac Bernays, who became chief rabbi or ḥakam of the German-Jewish community in 1821. Though conserving the old forms of the service, he introduced the sermon in German, and treated the old Jewish teachings in a modern scientific spirit. He strongly opposed the Tempel, where Eduard Kley (1818-40) and Gotthold Salomon (1818-57; d. 1863) preached; their successors were N. Frankfurter (1840-66), Max Sänger (1867-82), and H. Jonas (1858-89). After the sudden death of Bernays (1849), Anshel Stern became chief rabbi of the German-Jewish congregation (1851-88). In 1848 the Revolution brought about the emancipation of the Jews in Hamburg as in many other states of the German Confederation. In 1849 all members of the German-Jewish, as well as of the Portuguese congregation were free to acquire citizenship in the town. Every new Jewish settler, however, Portuguese excepted, was obliged to join the German-Jewish congregation, which formed a separate political corporation in the state. In 1864 this obligation was abolished. The old German-Jewish congregation was now dissolved, and again constituted itself a congregation in which membership was voluntary. It retained the exclusive care of all the institutions connected with education, charity, and burial. The management of affairs relating to public worship was transferred in 1867 to the Confederation of Synagogues for the Orthodox, and to the Tempel-League for the Reform Jews. The Confederation of Synagogues received at the same time the two large synagogues belonging to the congregation, and in return undertook to pay the salaries of the chief rabbi and other officials and to administer all the other ritual institutions, especially the sheḥiṭah. Since 1889 Marcus Hirsch (formerly at Alt-Ofen and Prague) has officiated as chief rabbi. The preachers of the Tempel-Verein or league are D. Leimdörfer (since 1882), Paul Rieger (since 1902), the latter's predecessor in office having been C. Seligmann (1889). The German-Jewish congregation possesses two principal synagogues—one, situated in the Elbstrasse, built in 1788 after the designs of the architect Sonnin; the other, on the Kohlhöfen, opened in 1859, and having 600 seats for men and 400 for women. The Tempel-League has its own house of worship, with about 400 seats for men and 250 for women. Besides these there are several smaller synagogues maintained by societies, especially in the part of the town "Vor Dem Dammthor," with its large Jewish population. The largest of these is the Neue Dammthor-Synagoge, where Dr. Grunwald officiated as preacher until Aug., 1903, when he was succeeded by Dr. Loewenthal. The hospital of the German-Jewish congregation, founded in 1843 by Salomon Heine in remembrance of his wife, and later richly endowed by his son Karl Heine, possesses accommodation for 120 patients in the main building, and has an annex for smallpox and other infectious diseases. The community has, besides, an orphan asylum for boys, another for girls, a home for aged people, and an infirmary. 1. 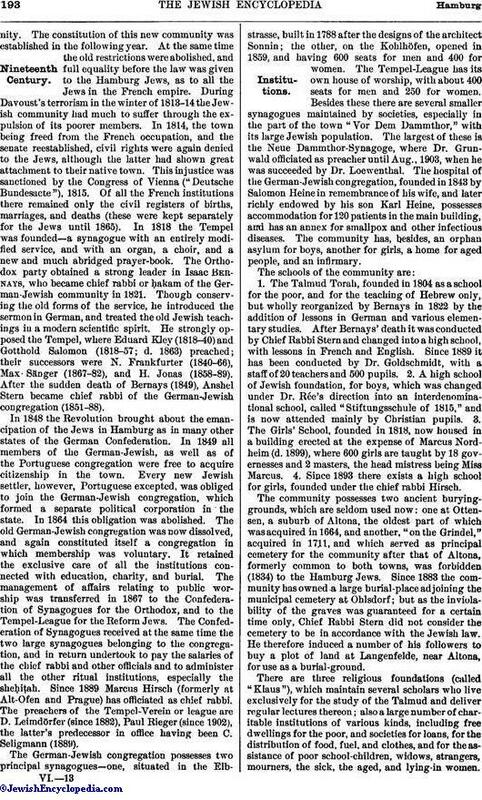 The Talmud Torah, founded in 1804 as a school for the poor, and for the teaching of Hebrew only, but wholly reorganized by Bernays in 1822 by the addition of lessons in German and various elementary studies. After Bernays' death it was conducted by Chief Rabbi Stern and changed into a high school, with lessons in French and English. Since 1889 it has been conducted by Dr. Goldschmidt, with a staff of 20 teachers and 500 pupils. 2. A high school of Jewish foundation, for boys, which was changed under Dr. Rée's direction into an interdenominational school, called "Stiftungsschule of 1815," and is now attended mainly by Christian pupils. 3. The Girls' School, founded in 1818, now housed in a building erected at the expense of Marcus Nordheim (d. 1899), where 600 girls are taught by 18 governesses and 2 masters, the head mistress being Miss Marcus. 4. Since 1893 there exists a high school for girls, founded under the chief rabbi Hirsch. The community possesses two ancient burying-grounds, which are seldom used now: one at Ottensen, a suburb of Altona, the oldest part of which was acquired in 1664, and another, "on the Grindel," acquired in 1711, and which served as principal cemetery for the community after that of Altona, formerly common to both towns, was forbidden (1834) to the Hamburg Jews. Since 1883 the community has owned a large burial-place adjoining the municipal cemetery at Ohlsdorf; but as the inviolability of the graves was guaranteed for a certain time only, Chief Rabbi Stern did not consider the cemetery to be in accordance with the Jewish law. He therefore induced a number of his followers to buy a plot of land at Langenfelde, near Altona, for use as a burial-ground. There are three religious foundations (called "Klaus"), which maintain several scholars who live exclusively for the study of the Talmud and deliver regular lectures thereon; also a large number of charitable institutions of various kinds, including free dwellings for the poor, and societies for loans, for the distribution of food, fuel, and clothes, and for the assistance of poor school-children, widows, strangers, mourners, the sick, the aged, and lying-in women.There are also provisions for free scholarships, for the transportation of poor school-children to the country ("Feriencolonien"), and for the promotion of handicrafts. Hamburg possesses a society for Jewish history and literature, another for Jewish folklore, and a Jewish public library. Besides the rabbis the following important Hamburg Jews deserve mention here: Salomon Heine (1767-1844), a financial genius and most charitable man, founder of the Jewish hospital; Gabriel Riesser (1806-63), who fought for the emancipation of the Jews, member of the Frankfort national assembly in 1848 and of the parliament of Erfurt in 1850, judge in Hamburg (the first Jew in Germany to hold that office) from 1860, and vice-president of the council of aldermen; M. Isler, chief librarian of the municipal library; Anton Rée (1815-91), pedagogue and member of the Reichstag; Isaac Wolffson (1817-95), lawyer and president of the council of aldermen, member of the commission for the new German civil code; M. W. Hinrichsen, member of the Reichstag (d. 1902); Siegmund Hinrichsen, president of the council of aldermen (d. 1902); B. Pollini, manager of the Hamburg Theater (d. 1897). The following were born at Hamburg: Samson Raphael Hirsch (1808-88), the energetic leader of modern Orthodox Judaism; Jacob Bernays, the philologist (1824-81), professor at the University of Bonn; Michael Bernays, his brother (1834-97), professor in Munich. 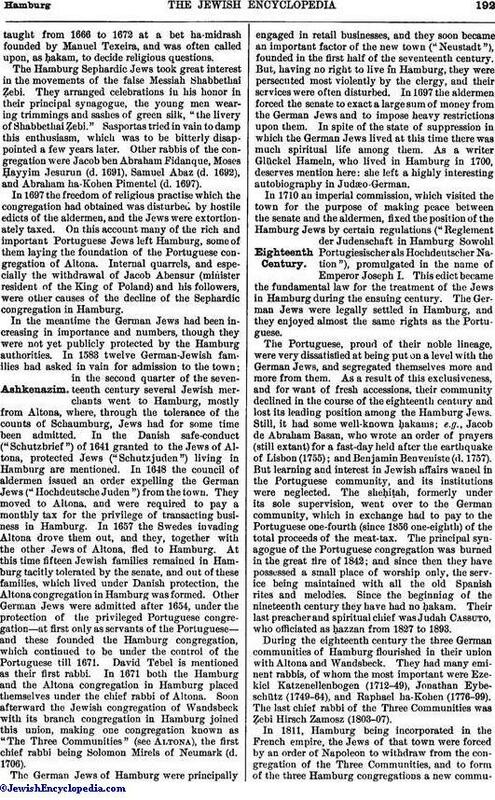 The Jewish population at Hamburg, which in 1814 numbered about 7,000, was 17,300 out of a total population of 626,000 in 1895. The number of contributing members of the German congregation is 3,535; that of the Portuguese, about 400.
idem, Hamburg's Deutsche Juden bis zur Auflösung der Dreigemeinde, 1811, 1903-04. According to the Oppenheim Catalogue, which, however, is questioned by Steinschneider, the "'Asarah Ma'amarot" was printed in 1680 at Hamburg. There is no doubt concerning the fact that from 1686 Thomas Rose, a Christian bookseller of Hamburg, was engaged in printing Hebrew books; the Earlier Prophets, with the commentary of Abravanel and the annotations of Jacob Fidanque, bear his imprint. Samuel ben Jacob of Glogau, who, in 1689, printed, in conjunction with a certain Gamaliel, the "Zera' Berek," was a compositor in Rose's office. Between 1700 and 1708 no mention of Rose occurs; but his establishment still existed in 1715. In 1708 he published the "Ṭa'ame ha-Miẓwot." which had been, in the previous year, edited at Amsterdam; in 1715 he published the "Miktab me-Eliyahu," the last work known to have come from his press. His son Johann continued his establishment until 1721. Among his publications were the "Leḳeṭ ha-Ḳemaḥ" of Moses Ḥagiz (1711) and the "Sha'are Torah" of Solomon Hanau (1719). From this press came, according to Steinschneider, the "Zemirot Purim" (1715), a Purim parody with a Judæo-German translation by Samuel ben Mordecai Poppert. During 1710-11 Isaac Hezekiah di Cordova established a press for which Isaac ben Joseph Benveniste and Isaac ben Moses Ḥayyim Levi Horwitz were compositors. No typographical records exist for the years between 1721 and 1780; but in the latter year a press was founded by Leser and Nathan ben Moses Mai. It endured ten years; among its compositors at various times were Jacob ben Judah Löb ben Zerach (1788) and Mattathiah ben Judah Löb Guttmann (1790). The first printing establishment at Altona was founded by the above-mentioned Samuel ben Mordecai Poppert in 1720, in which year he produced the "Megillat Anṭiokus"; but, his means being limited, his productions were few. Between 1721 and 1731 he issued the following: an index to the Talmud entitled "Me'orer ha-Zikkaron"; Jacob ben Joel's annotations on the Pentateuch entitled "She-'erit Ya'aḳob"; Ezekiel Katzenellenbogen's directions for "Jahrzeit"; "Seliḥot"; "Abot de-Rabbi Natan"; dirges for the Ninth of Ab; "Danielbuch," in Judæo-German rimes; a new edition of the above-mentioned Purim parody; and, finally, "Spanische Heiden," in Judæo-German. A new printing-press, which, however, had but a brief existence, was founded in 1732 by Ephraim Heckscher with the "Zera' Yisrael" of Israel ben Jacob as its first publication. In 1735 Aaron ben Elijah Cohen opened a printing establishment, which was still active in 1764. But for the "Adne Paz" of Ephraim ben Samuel Heckscher, published in 1743, nothing would be known of the "Noue Druckerei" founded by Abraham ben Israel Halle. Owing to its proximity to Hamburg, the printing-house in Altona was practically a branch of that of the former city. Among the printers of Altona may be counted Jacob ben Ẓebi Emden ( ), from whose press came the polemical works against Jonathan Eybeschütz. The most important printing establishment of Altona was that founded by Moses ben Mendel Bonn, which is still active, the most noteworthy of its later productions being the catalogue of the manuscripts of the Hamburger Stadtbibliothek, edited by Steinschneider (1878). idem, Cat. Bodl. s.v. Rose, etc.